In a country spanning three time zones, if you hit the road frequently you'll probably want to hit it with something big. And there are few bigger U.S. offerings than those put forth by Ford Motor Company. Its largest is the 2013 Ford Expedition, available in both standard (119-inch wheelbase) and EL (131-inch wheelbase) versions. Regardless of the Expedition's so-last-century architecture, there remain a lot of people hauling kids and towing trailers. And for those that regard a truck-based SUV as a necessary tool, the Expedition remains one of the best. In its competitive segment, cross-shopped against Chevy Tahoes and Suburbans, and – to a lesser extent – the Nissan Armada, Ford's standard feature list is arguably higher, and its mechanical spec more sophisticated. Should you and your family (or you and your business) require room for eight and 9,000 pounds of towing capability, Ford's 2013 Expedition responds to that need. The now-venerable Expedition offers an ambitious spec (overhead cam powertrain, all-independent suspension) to complement an aggressive menu of options and individualization. The Heavy-Duty Trailer Tow package now includes an integrated trailer brake controller, available on XLT and standard on Limited and King Ranch. Working with the Expedition's ABS system, it provides improved trailer braking when compared to aftermarket units. For entertainment, Limited and King Ranch models offer a factory-installed DVD system for rear passengers and 20-inch chrome-clad aluminum wheels. Let's consider a basic law in automotive physics: A vehicle weighing some 6,000 pounds will rarely provide the same driving dynamic of a vehicle weighing 4,000 pounds. Most variants of the 2013 Ford Expedition and Expedition EL start out weighing almost three tons – when loaded with passengers and cargo they will weigh much more. To that end, anticipate the additional mass when steering, accelerating or braking. Thankfully, Ford's engineers have done their best to disguise the Expedition's heft without actually reducing or eliminating it. The big Ford's center of gravity is lowered with the incorporation of an all-independent suspension, while the SUV's 5.4-liter V8 supplies sufficient torque (365 lb-ft) to adequately move that mass. Directional control is provided by power-assisted rack-and-pinion steering, while stopping is accomplished via 4-wheel anti-lock disc brakes. Notably, if opting for 4-wheel drive, the Expedition's approach and breakover angles are slightly diminished, whereas the long-wheelbase Expedition EL's are (incrementally) enhanced. Be careful out there. The Expedition EL's 12-inch-longer wheelbase and nearly 15 inches of additional length provide a huge improvement in capacity with little increase in cost or reduction in fuel efficiency. Sure, your garage may not accommodate the extra length, but that's a small price to pay if you're actually intending to use your full-size SUV. With more hide than will be found on some ranches, the King Ranch edition of Ford's 2013 Expedition is the most expressive combination of truck-like capability and upscale appointment currently on the market. We'd get ours in EL form, with more room to carry more saddles. While there's no official relationship between Ford's interior design team and Dwell magazine, with this generation of Expedition Ford was among the first to incorporate truly contemporary design themes into a truck-based architecture. 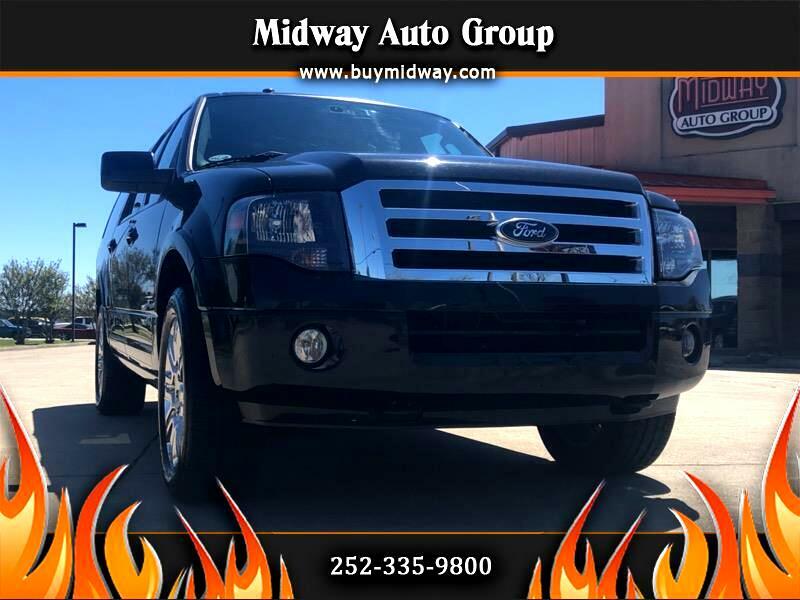 In any of the 2013 Expedition's three trim levels, seats are comfortable and provide enough seat travel to comfortably accommodate passengers of virtually any size. As a bonus, the Expedition's third row provides room for real adults. And when not in use that third row folds flush into the floor, a benefit of the Expedition's fully independent rear suspension. A King Ranch Expedition may no longer get you the choice parking spot at the high-end steak place, but it retains a credible spot in the hearts and minds of those doing hard work during the week while playing hard on weekends. The 2013 Expedition's prominent grille and upright stance speak (cubic) volumes, whether clothing the base XLT or upmarket King Ranch. And with a wide-ranging menu of exterior colors and interior trims, the Ford Expedition has historically been every bit as expressive as its clientele. And if "enough" is never enough, opt for the Expedition EL, providing an additional foot of wheelbase, 14 inches of additional length and over 42 cubic feet of storage behind the Expedition's third row. With room for eight and the ability to tow up to 9,200 pounds (Expedition 4X2), the most notable piece of standard equipment on or in Ford's 2013 Expedition is its capability. And while "Built Ford Tough" is the product team's mantra, Ford hasn't forgotten creature comforts. Ford is the only domestic manufacturer to combine an overhead-cam powerplant with all-independent suspension for levels of performance and composure you can take to the bank – or the beach. And given its family mission, safety is front and center, with AdvanceTrac traction control working with Roll Stability Control to enhance your confidence while driving in unpredictable weather or circumstances. Ford's 2013 Expedition and Expedition EL offer a total of 10 equipment levels, one of which should match your needs and/or budget. A rear-seat DVD entertainment system is a factory-installed option on Limited and King Ranch versions of the Expedition, while drivers can stay connected with the outside world via MyFord Touch. With a menu of connectivity includes Wi-Fi capability, text-to-voice capability, HD Radio with iTunes tagging, and voice-activated navigation, your 2013 Ford Expedition can be every bit the nerd you are. Finally, new paint colors include Blue Jeans Metallic, Kodiak Brown Metallic and Ruby Red Metallic Tinted Clearcoat. While the 2013 Expedition's 5.4-liter V8 is certainly adequate, Ford's one offering is overwhelmed by the multitude of choices available from Chevrolet and GMC. The Ford V8's 310 horsepower and 365 lb-ft of torque are well-matched to the chassis, and that power is enhanced by a 6-speed automatic, but the package falls short of GM's 5.3-liter V8 (at least in horsepower) or GM's 6.0-liter V8.